FILE - A health worker prepares a syringe with a vaccine against measles in Rio de Janeiro, Brazil, Aug. 6, 2018. A Houston nurse who posted protected health information about a young patient with measles to a Facebook page related to the anti-vaccine movement is no longer employed at Texas Children’s Hospital, the facility said in a statement Thursday. The nurse, who has not been identified, posted to the page that despite the fact that the young patient was “super sick,” was admitted to the ICU and "looked miserable," the nurse was still opposed to vaccines, NBC News reported. The nurse was investigated and ultimately dismissed for privacy violations, but her anti-vaccine stance concerns others in the medical field. Dr. David Persse, director of the Houston Health Department, was dismayed that a medical professional would be opposed to childhood vaccinations. 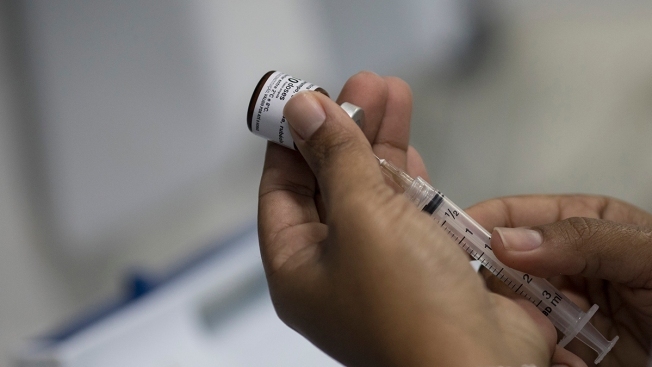 "She is one of the few people who has seen firsthand how devastating these diseases can be, and she has still taken this position against vaccines," Persse said in an interview. Measles has been eliminated in the United States through vaccination, but every year, cases are imported from other countries. People who are not vaccinated or who are incompletely vaccinated can become infected and carry the virus with them. It will spread if there are pockets of other unvaccinated people.